October supplier payments are out and this month there a number of large unusual payments. For some reason Barnet have paid Harrow Council £7,167,500 under the heading of public health - not sure what that is for? In addition Bevan Brittan LLP was paid £2.45 million for IT services. Given that they are a legal practice I suspect that someone in Barnet has mislabeled what this payment is for. Capita had a relatively light month receiving only £1.57 million but one old favorite, Comensura, received a whopping £1,815,572.53. That brings Comensura's running total for this financial year to £10,812,965.97 and, as I have mentioned before, there is no chance of Barnet hitting its target of £15.5 million for the entire year. 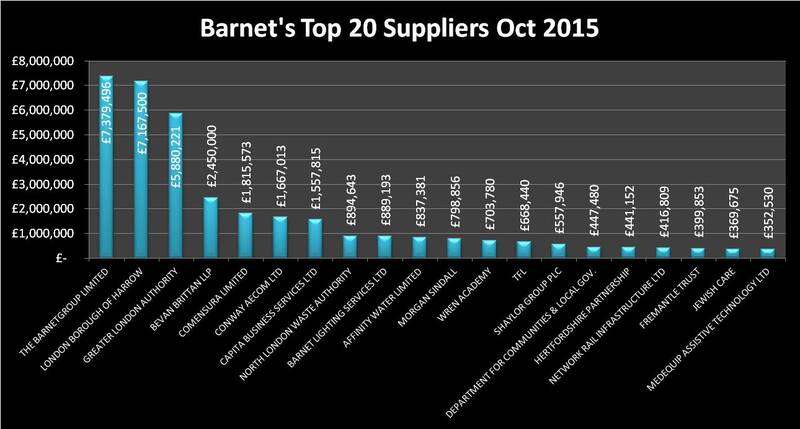 It is also important to remember that Capita get a percentage of that spend under their gainshare clause so the more Barnet pay Comensura, the more Barnet have to pay Capita. Another old favorite, Impower, was paid £82,912.40 for "other, professional and various services" but not consultancy fees so that's ok then - not. CBRE Indirect Investment Services Ltd were paid £120,000 and Network Rail Infrastructure were paid £416,808.66 both for "consultancy services". In addition, Affinity Water received a single payment for £831,952.67 in addition to a number of much more modest payments. I suspect some of these large payments may relate to the Brent Cross Development and may or may not be reclaimed from the developer. It would be really helpful if we could have a clear designation of what is recoverable and what isn't so we can see exactly what this Brent Cross development is costing Barnet residents. As always I will keep monitoring payments.